The fife is, historically, a small, keyless, transverse flute with a narrow, completely cylindrical bore and six finger holes. This page will focus on the traditional American and British fife used in the 18th, 19th, and well into the 20th centuries. These were most often made in one piece, of wood, though metal fifes became more common as the 19th century progressed. The exterior might be cylindrical, but a wooden fife body would most often taper towards both ends, which were protected by metal ferrules. Top: Cocuswood Bb fife, a "Crosby model" by Geoge Cloos (New York, c.1900). Bottom: Cocuswood Bb fife by J. W. Pepper (Philadelphia and Chicago, c.1900). Fifes (and other historical flutes on this web site) are named by the tonic of their basic scales; this is the same as the note sounded when all six finger holes are closed. The Bb fife, the most common size for most of the 19th century, has lowest note b'b, though as we mention below, this low note is essentially never used. (However, fifes in C were more prevalent than those in Bb at the beginning of the 19th century and fifes in G, D, Eb, and F are used in France.) The Bb fifes above have respectively lengths 43.4 cm and 40.2 cm, and are tuned to approximately A=435 and A=452. Some would say that a cylindrical bore and lack of mechanism are essential features of a fife. But fifes with one key and a slightly tapered bore were made (e.g. in France) in the 19th century, and in the middle of the 19th century the term "fife" was appropriated by some to describe what are perhaps better called "band flutes". The resulting confusion is briefly discussed in this article on the Dayton C. Miller Collection website. Also see this entry on fife from the 1906 Grove's Dictionary. These band flutes were small flutes with conical bores and one, four, or six keys, and whose playing characteristics differed significantly from those of true fifes. A Treatise on the Instrumentation of Military Bands by C. Mandel (Boosey, London, 1860) uses the term "so-called fifes" for small flutes just below the piccolo, in Bb, B, and C (see here) . These are not traditional fifes, but are often confused with them. four-key Bb band flute (c.1900). The most significant and defining characteristic of the true fife is the narrowness of its bore in relation to its length and, therefore, its preference for the higher and highest notes of its range and its resulting characteristic (sometimes shrill) sound. Click here for a sound sample. A fife is expected to play regularly in the first sixth of its third octave and almost never in the first octave (some have low notes that barely speak). For example, the Cloos Bb fife shown at the top of this page has a bore of approximately 11.1 mm (and some fifes have bore diameters of 11 mm or less) while the Bb band flute shown just above, with approximately the same sounding length, has a 13 mm bore in the head joint. Unlike a true fife, this particular band flute has a sonorous first octave, much better than the fife, and a less charming and more difficult third octave. The original intended use of the fife was as a military flute, for signaling and to accompany marching; and as such it may be heard today, accompanied by drums, in reenactments of revolutionary and civil war battles, and in commemorative or patriotic events. It was said that a fife could be heard several miles away, over artillery fire. The American fife tradition descended from that of the British military. After a period of disuse, the fife was reintroduced into the British army before the middle of the 18th century, reportedly by the Duke of Cumberland in 1745. 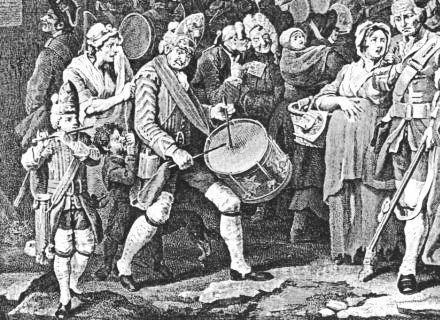 Detail from an engraving March of the Guards towards Scotland in 1745 by George Hogarth (1750), showing a fife and drum. For a very brief discussion of the earlier history of military flutes in Europe, see here. Much information on the history and current use of the fife in America can be found on the web (searching for "fife and drum" may turn up the most relevant links). Fifes were also used, by amateurs and others, for popular and folk tunes and for dance music. (The fact that fifes are relatively inexpensive no doubt contributed to their popularity.) The cover illustration of A Selection of Scotch, English, Irish, and Foreign Airs Adapted to the Fife, Violin, or German-Flute published by James Aird in Glasgow (c.1800) shows the association of fifes with the military though the included tunes have no relation to military music, with the possible exception of a few marches. The cover of Aird's Selection, volume 2 of 6. The mail order firm of Sears, Roebuck & Co. provided traditional fifes well into the 20th century. Listing of fifes in the 1908 Sears, Roebuck & Co. catalog. All are cylindrical and keyless. Those in the center and the one on the right are metal. Other catalog listings of fifes, as well as photographs of historical fifes, are available on this fifemuseum site. It will be seen from the photos that early 19th century fifes tend to have smaller and more uniformly sized and spaced holes than those from the last decades of the 19th century. A fife in C by Ron Peeler modeled (I believe) on an instrument by Valentine Metzler (c.1800). The chart below is borrowed from Complete Music for Fife and Drum by Walter D. Sweet. We show this one because it makes very clear that, in the traditional notation, the note written as d' just below the staff is not the lowest note of the fife but an octave above. (Note that finger hole 1 is open for the written d'.) The highest note of the usual range, written as b'', will sound as g'''' on a Bb fife. Most fife methods show fingerings only for the "usual range" and omit the first octave, whose notes cannot be heard above drums. Though fifes tend to be diatonic and prefer the scales of (written) D and G, fife methods include fingerings for chromatic notes outside these keys. Early fifes with smaller holes tend to have better intonation on these chromatic notes. Bb Band Fife by Cloos (NY, c.1930s). We close with an image of an instrument by the Cloos company of New York that resembles one depicted in a 1938 advertisement of the firm where it is called a "B FLAT BAND FIFE". The other instruments on that page are (mostly) keyless fifes in wood or metal. With all due respect to Cloos, this six-key "band Fife" is not a true fife, but is more like the six-key band flute described at the top of this page—and not just because of the keys. More significantly, the body (it is in two pieces) has a conical bore (12.6 mm at the top and 10.1 mm at the bottom). The head joint is cylindrical and metal lined with a tuning barrel. Like the band flute, it has a more sonorous first octave and a more difficult third octave than a typical fife.